Daniel Western is an arranger, composer, performer, and educator. 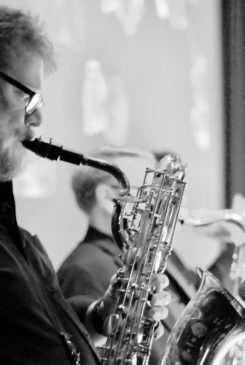 He holds degrees from The University of Alabama in arranging and saxophone performance. Daniel primarily composes and arranges for The Birmingham Seven but he has also produced works for The Temptations Review featuring Dennis Edwards, the Tuscaloosa Symphony Orchestra, the Cheyenne Symphony Orchestra, the American Council for the Russian National Orchestra, and various high school and collegiate ensembles. Daniel has worked with The Temptations, The Four Tops, The O’Jays, Mary Wilson and the Supremes, Frankie Valley, Ruben Studdard, Joan Rivers, Regis Philbin, Wayne Newton, Lew Soloff, and Lou “Blue Lou” Marini. Also, he has been teaching at the college level for the past fourteen years and is currently Instructor of Music Theory at The University of Alabama.